Open USC, search for tomboy, docky, 7zip or any other application that has reviews. Click on any one of those results. Observe screenshot, details about application, but reviews are absent. Sits there for a while. Then changes to "Got an opinion?" and offers me the erroneous chance to be the first to review the app. If I attempt to leave a review, then I get the chance to login with single sign on. However once entering my credentials I get left with "One moment please" and "Signing in" which never completes. I confirm the exact same behaviour. 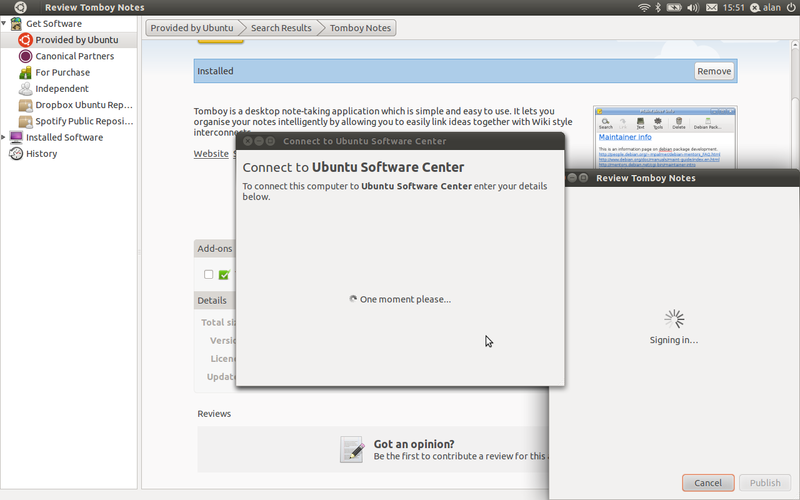 Sadly this is one of the many Ubuntu features which are broken behind a proxy. I must confirm this problem. Software center itself works fine but never show reviews behind proxy. It turns out that this is a limitation of piston-mini-client that is used for the ratings&reviews feature. This will also need a new dependency to piston-mini-client (python-socksipy). No need for python-socksipy, the required socks.py module is part of the httplib2 upstream release. I see this is marked as fixed, but I am not seeing that the proxy is working on the current oneiric (version 5.0.2). Is this a known issue? The images are working, and the package descriptions, but no reviews. Just in case (from reading other related bugs) my proxy does NOT need authentication. Setting the enabled to true via the command-line worked. The question is then why is the proxy enabled set to false when the proxy settings in the control panel set, but there is no "enabled" setting in the UI?